Prom DVD Review From drama to romance and a touch of comedy, Prom is definitely a feel good movie that ticks all the right boxes in this clichéd teen movie. Definitely fun! Disney's PROM is definitely aimed at the young female teenager that not only ticks all the right boxes for this age group but is actually a rather "okay" film that can also be enjoyed the whole family. 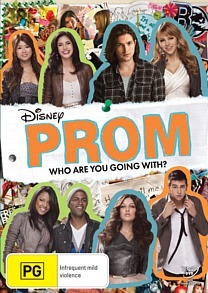 The main protagonist of PROM is Nova (Aimee Teegarden) who even though plays one of those sickly goody two shoes characters; she has this unique charm about her. In spite of all this, as her school years are just about to end, Nova decides to give the school a parting gift by planning their Prom but you can already see this train wreck waiting to happen. Gathering a Prom committee together, Nova and her fellow colleagues have created the perfect night for their yea level but something happens. The school building where the prom is to be held is burnt down and all their months of preparation is destroyed. With nothing left, the prom committee walks away and Nova is left alone to ponder the future. But as Nova is the perfect student, she decides to do the unthinkable by trying to rebuild the prom but a spanner is thrown into the works again. As Nova was the perfect student, she had little time for boyfriends… until now. This is where Jesse (Thomas McDonell), the school's bad boy comes into the picture and without spoiling the story, although it's quite predictable how it will end, she not only wants to fix the prom but also this young man. Given that facts, Prom is one of those feel good teen romance movies that contains some decent acting by those involved, especially Aimee Teegarden (Friday Night Lights) who puts a special spin on her character Nova. Although Nova and Jesse are the main characters, Prom also revolves around some other interesting students regarding life in general such as moving from school to university, romantic relationships and the future of their lives after school. All in all, it’s quite fun to watch these relationships and stories unfold, even though it’s oozing with teen angst and way too many stereotypes… but somehow it works. With decent video and audio, Prom looks and sounds good on a FULL HD TV and a special mention should be made about the soundtrack that really creates this poppy and fun movie. From drama to romance and a touch of comedy, Prom is definitely a feel good movie that ticks all the right boxes in this clichéd teen movie. Definitely fun!